All six of the 2013 Research Expo faculty speakers have confirmed...one from each of the Jacobs School's six engineering departments. Research Expo is the annual research exhibition of the Jacobs School of Engineering, featuring 230 graduate student research posters, faculty talks, and a networking reception. The new generation of commercial jets constructed with high-strength carbon fiber composite materials are light-weight and fuel-efficient. But blunt impacts from baggage and cargo laoders and hail stones can result in damage nearly invisible to the naked eye. 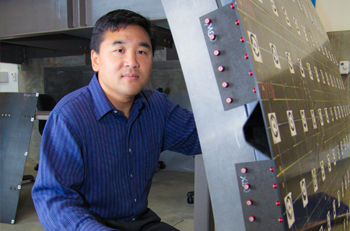 Prof. Hyonny Kim will describe research to detect, predict and avoid damage to modern composite airframes. 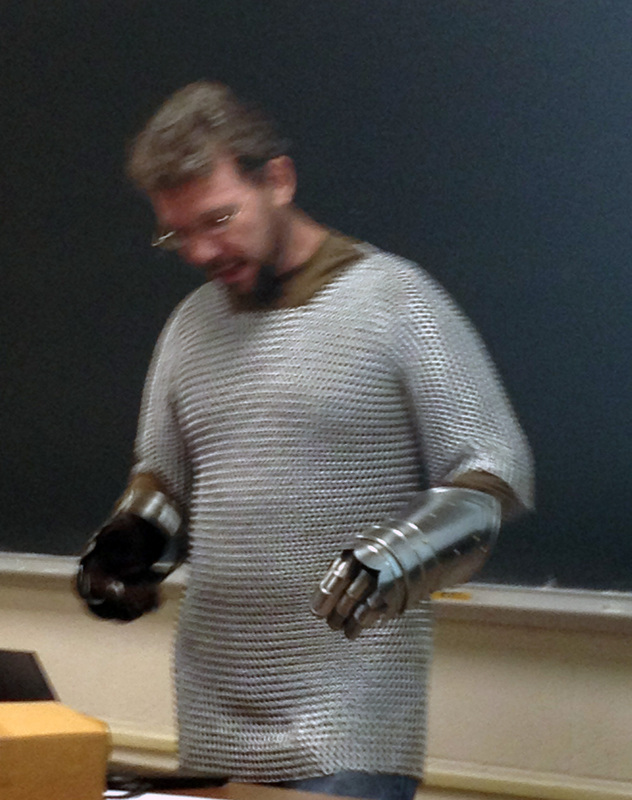 The event takes place Feb. 28 at The Boeing Company, in Seal Beach, Calif.
Why Was a Computer Science Professor Wearing Chain Mail on the First Day of Class This Quarter? If you want to see first-hand some of the other gifts Savage and Voelker exchanged, head out to the CSE building: the NASCAR shift lever toilet flusher is now a door handle in the grad student lounge. The hard drive clock is on display on the third floor. Thank you for the computer science and engineering department at the University of Washington for giving us a heads-up on this story with this post. From left: Rady graduate student Peter Butler, Moxie Center Director Jay Kunin and Cody Noghera, deputy director of the Jacobs School's Corporate Affiliates Program. Students who want to create smart phone apps. Students who have an idea for a business, which they'd rather not talk about to protect their intellectual property. 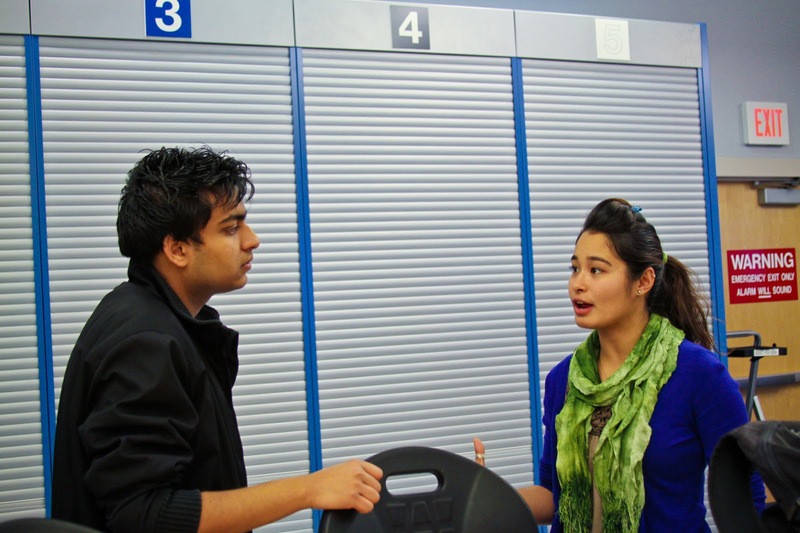 Graduate students who are starting their own business and are trying to recruit undergraduates. 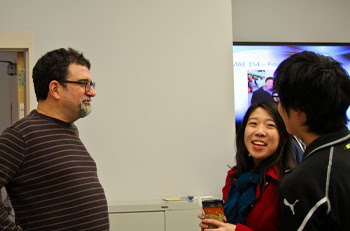 These were some of the people in attendance at the Moxie Center's first Open House Jan. 15, in the basement of the Computer Science and Engineering building. 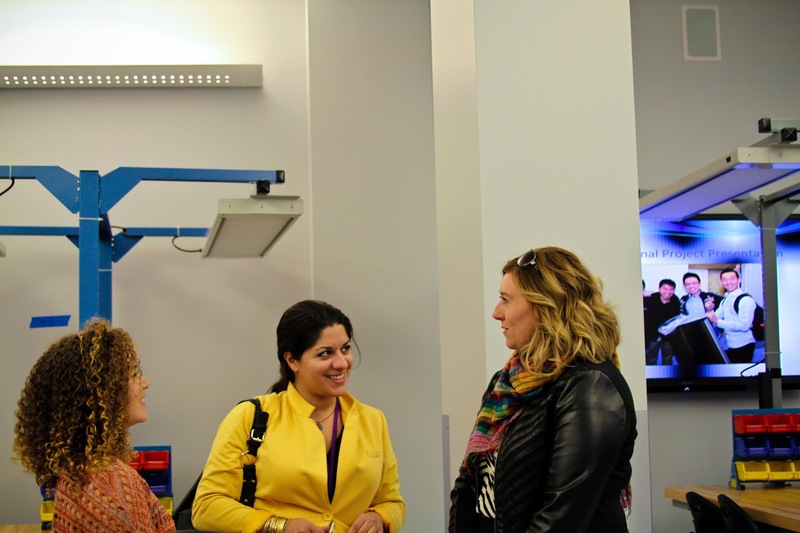 The center is a business incubator targeting undergraduate students, which also offers educational programs. Sharon Kuo, a senior majoring in computer science, wants to develop an Android app. 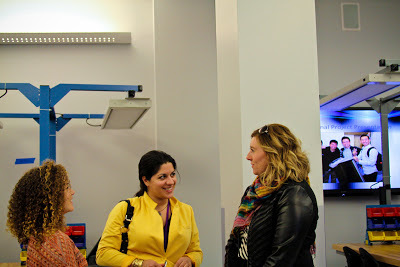 She came to the open house to see whether the center would be a good place to develop her project. "It seems really cool," she said. "But I want to learn more." Computer science students Nick Troast and William Samuels, along with computer engineering major Sayed Amir, found out about the open house from one of their professors. They want to start a business and were excited to learn about all the services the center provides, including advice about protecting your intellectual property; mentoring; and funding. "We're going to try to take full advantage of it," Samuels said. Meanwhile, Peter Butler, a graduate student at the Rady School of Management, was looking for undergraduate students to work as software engineers for his next business venture. "I come from Silicon Valley," he said. To learn more about the Moxie Center, visit the center's website; and read this story about the center's creation and goals. 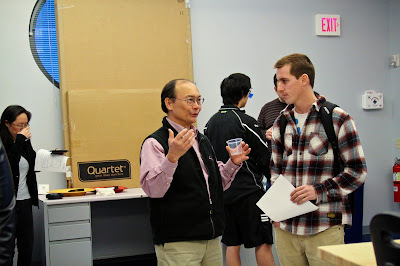 Below are some pictures of the Jan. 15 event. On Dec. 17, NASA crashed two spacecraft equipped with cameras manned by UC San Diego students on the surface of the moon after they had successfully completed their science and outreach missions and ran out of fuel. Before the impact, one of the spacecraft's cameras captured this stunning video of the surface of the moon's far side, from an altitude of about 6 miles. Learn more about the spacecraft and the role UC San Diego engineering students played during the mission here. 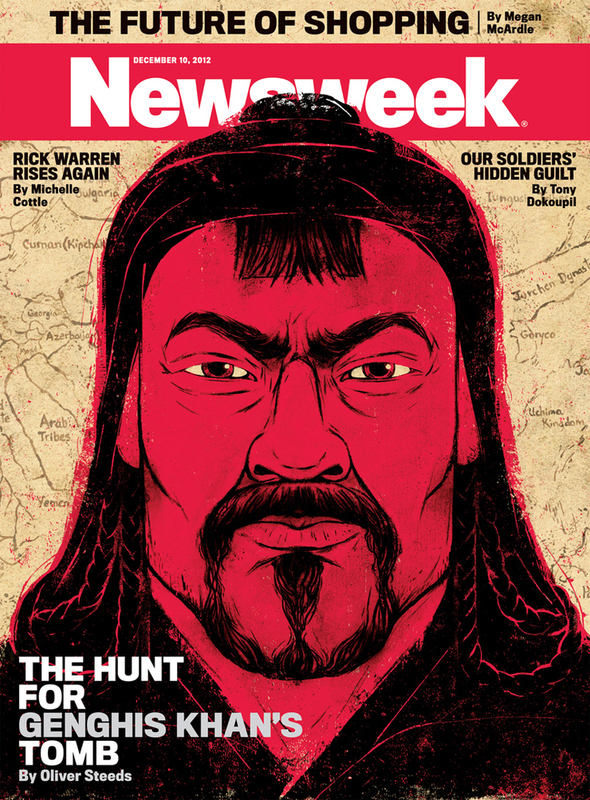 Albert Lin, who earned his bachelor's, master's and Ph.D. here at the Jacobs School, has been on a high-tech quest for the tomb of Genghis Khan since 2005--and last month, his work was featured on the cover of Newsweek. Lin’s explorations are groundbreaking, in part, because he never breaks ground. He uses non-invasive, computer technologies to gather, synthesize and visualize data from previously unreachable places, with no damage to the environment. Cutting-edge tools such as satellite imagery, ground-penetrating radar and remote sensors allow Lin to make archaeological discoveries while respecting traditional beliefs of indigenous people. As a research scientist in the California Institute for Telecommunications and Information Technology (Calit2), Lin is also using 3D immersive technologies to study satellite images and data gathered during field expeditions to Mongolia. Read the full Newsweek story here. Learn more about Lin's quest for Ghenkis Khan's tomb here. Todd Coleman, a professor of bioengineering at the Jacobs School, is on the cover of San Diego Magazine this month as part of the publication's 50 People to Watch feature. The magazine is highlighting Coleman for his work on wireless, non-invasive sensors that can be worn directly on a patient's skin and are almost tattoo-like. The sensors are currently being tested in the neonatal intensive care unit at the UC San Diego Health System. The study is partially funded by the Bill and Melinda Gates Foundation. 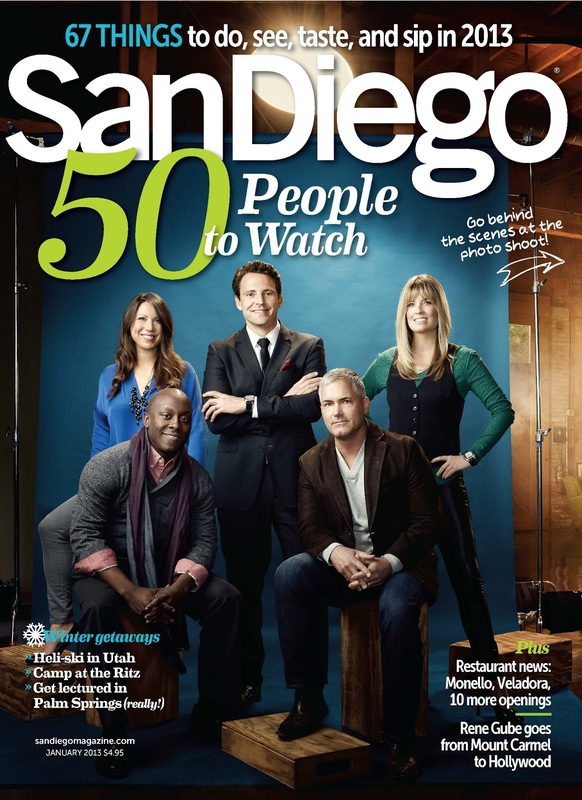 "We're sensing big things to come," the magazine says about Coleman's work. Read the magazine's profile of Coleman here. UT San Diego recently wrote a story about a new software that dramatically helps streamline paperwork for the construction industry. "Linked" was developed by Jacobs School alumna Terriann Nohilly, 24, who graduated from the Jacobs School with a bachelor's in chemical engineering in 2009. The software "ties together mountains of blueprints, memos and other data into a web-based, visually oriented file box that helps field superintendents and subcontractors manage construction sites with a minimum of confusion," according to the UT San Diego story. The program runs on tablet computers. A survey after a field test showed that users saved 5.5 hours a week by using it. Nohilly told UT San Diego that she wasn't sure what allowed her to come up with the breakthrough program, although being young, a woman and a UC San Diego graduate were all likely factors. "I think I'm a little weird," she told the paper. "I'm not a typical engineer. I think I look at things differently. And once I dialed in, I really had this desire to bring this creative fusion, this combination of the artistic and technology, and this new way of thinking about it -- this idea of digitally looking at it differently." 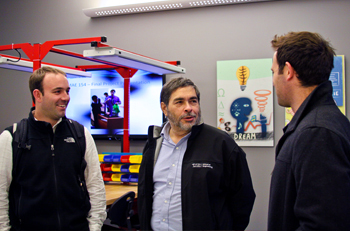 A project led by Jacobs School alum Andre Berracasa is being recognized at the 2013 International CES show this week in Las Vegas. The MxL267 24-channel Full-Spectrum Capture (FSC™) cable receiver developed by MaxLinear Inc. has been named an International CES Innovations 2013 Design and Engineering Awards Honoree in the Embedded Technologies category. Berracasa is the System Lead for the project. MxL267 is the first Full-Spectrum Capture device capable of simultaneously receiving any combination of 24 channels located arbitrarily inside the cable spectrum, according to a MaxLinear press release. “The MxL267 deserves a CES Innovations Award because it is the key to the development of cable set-top boxes and gateways that give consumers all of the programming they want while minimizing power consumption and network maintenance costs for cable operators. The proof is in the success of the chip, which has enjoyed more than a dozen design wins by leading cable system manufacturers including ARRIS Group, Inc. in the first five months since the chip was launched,” says the award entry. Berracasa earned a bachelor's in computer engineering at UC San Diego in 1978, one of the first students to graduate with a degree in that major. He went on to work at Linkabit, Teledyne Ryan Electronics, ComStream and Carrier Comm before joining MaxLinear in June 2010. The MxL267 he developed supports up to 1 Gigabits per second (Gb/s) download speeds when bonding all 24 channels together. This enables cable operators to leapfrog the standard download speeds of 300 Megabits per second (Mb/s) for home Internet service. With 24 channels in the MxL267, cable set-top boxes can support enough channels for multiple TVs, DVRs and simultaneous viewing of programming on multiple screens while still offering untouchable data download speeds. The MaxLinear press release is available here. A complete list of the Embedded Technologies honorees is available here. Computer science professor Ramamohan Paturi was named one of six researchers to watch in 2013 by the La Jolla Light. Paturi's research "includes complexity theory, digital libraries, medical data mining and evidence-based medicine. He is also founder and chairman of San Diego-based Parity Computing, which recently launched Clinical Vigilance for Sepsis, a software system for healthcare providers caring for patients at potential risk of deadly sepsis which strikes more than 750,000 American each year," according to the publication. "Currently, early detection of sepsis is complex and costly, requiring a high level of expert caregiver attention. Clinical Vigilance for Sepsis integrates with current clinical workflow to assess patient data already being collected as part of standard care. The software automatically and continuously monitors all patients in a hospital setting, issuing alerts that bring immediate attention to at-risk patients." Read the full story and see a complete list of the researchers to watch here. Our news feed is now part of the engineering.alltop.com page. Check it out.